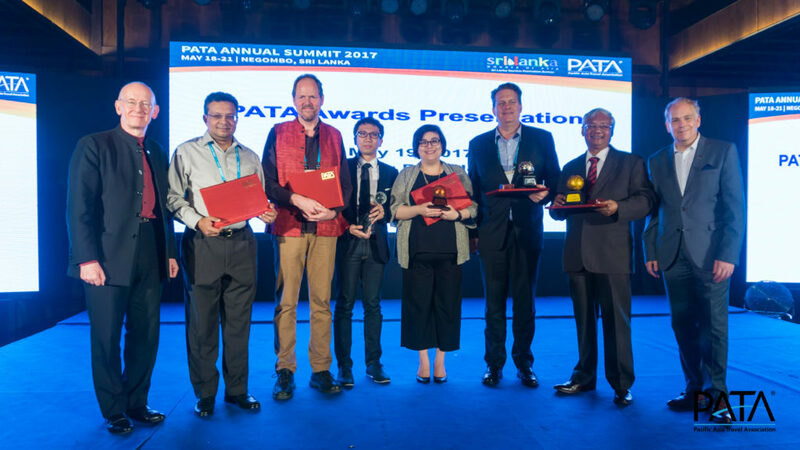 BANGKOK, 2017-May-24 — /Travel PR News/ — The Pacific Asia Travel Association (PATA) has presented a series of awards in recognition of contributions made to the responsible development of travel and tourism in the Asia Pacific region. The PATA Awards of Merit are reserved for individuals who have consistently contributed to PATA and the PATA Chapter network over an extended period. This award was presented to Mr Peter Semone, managing partner of the strategic advisory organisation, Destination Human Capital, and founder of the internationally acclaimed Lanith – Lao National Institute of Tourism and Hospitality vocational school in Lao PDR. Mr Semone has also acted as Chief Technical Adviser and Team Leader for European donor and Asian Development Bank projects. He also consults for United Nations agencies including the World Tourism Organization (UNWTO) and the International Labour Organisation.The PATA Chairman’s Award was presented by outgoing Chairman Andrew Jones to Ms Sarah Mathews, Head of Destination Marketing APAC – TripAdvisor. The PATA Chairman’s Award was presented by outgoing Chairman Andrew Jones to Ms Sarah Mathews, Head of Destination Marketing APAC – TripAdvisor.Born and raised in Hong Kong SAR and fluent in Mandarin and Cantonese, Sarah has spent most of her life living in Hong Kong SAR, Beijing and Australia giving her a deep understanding of the region. Her career started with Cesar Ritz Colleges and then eventually joined the London team for the Hong Kong Tourism Board and Visit Flanders where she held positions in MICE and international marketing. Her role with both organisations meant regular contact with industry partners and working together to drive awareness of each of the destinations. The PATA Face of the Future award for 2017 was presented to Mr Faeez Fadhlillah. This award is presented annually to an exceptional ‘rising star’ in the industry, having exhibited initiative and leadership in the advancement of tourism as well as demonstrating a commitment to the sustainable development of the Asia Pacific travel industry in line with PATA’s mission. It is the most prestigious honour for young tourism professional in Asia Pacific. Mr. Fadhlillah is the CEO and Co-founder of Tripfez, an innovative, state of the art travel portal dedicated to the rise of global Muslim travellers. Named as one of Forty Individuals Who Shaped Southeast Asian E-Commerce by EcommerceIQ, he was named 30 under 30 by Forbes magazine in 2016, 40 Under 40 by Prestige, Top 10 Young Entrepreneur Rising by Top 10, People to Watch 2016 by TTG as well as the Most Innovative Young Leaders Award 2016 by UCSI. Heading the brand of Tripfez and Salam Standard, Faeez advocates the concept of localising the travel experience through information enabling travellers to make an informed decision. The PATA Certificate of Appreciation was awarded to Dr. Chris Bottrill for his work in leading governance revisions to align strategic efforts of the organisation in order to engage a broader base of membership. Dr. Bottrill is the Dean of the Faculty of Global and Community Studies at Capilano University in North Vancouver, Canada. He holds a PhD in tourism network and destination development. Chris oversees programming and development in tourism and hospitality fields in a complex portfolio that includes five academic schools, international projects, and aboriginal education programming. He has taught a wide array of tourism topics including destination development, sustainability, marketing, and entrepreneurship at universities in Canada, New Zealand, the USA, and Austria. The Honorary Membership Award is given to the official host to recognise their valued contributions as well as to encourage their continued interest in PATA. This year, the Honorary Membership Award was presented to Mr Sutheash Balasubramaniam, Managing Director of Sri Lanka Tourism Promotion Bureau, the host of PATA Annual Summit 2017. This entry was posted in Business, Festivals and Events, Tourism, Travel, Travel Awards, Travel Management, Travelers and tagged Asia-Pacific region, Dato Azizan Noordin, Mario Hardy, PATA, Peter Semone, tourism, travel. Bookmark the permalink.